I am shocked it has been a month since I posted and it is already the new year !!! I enjoyed the holidays so much, and had so much fun, it just flew by !! I was not doing much work over the holidays, but did some presents and other things for myself and family. 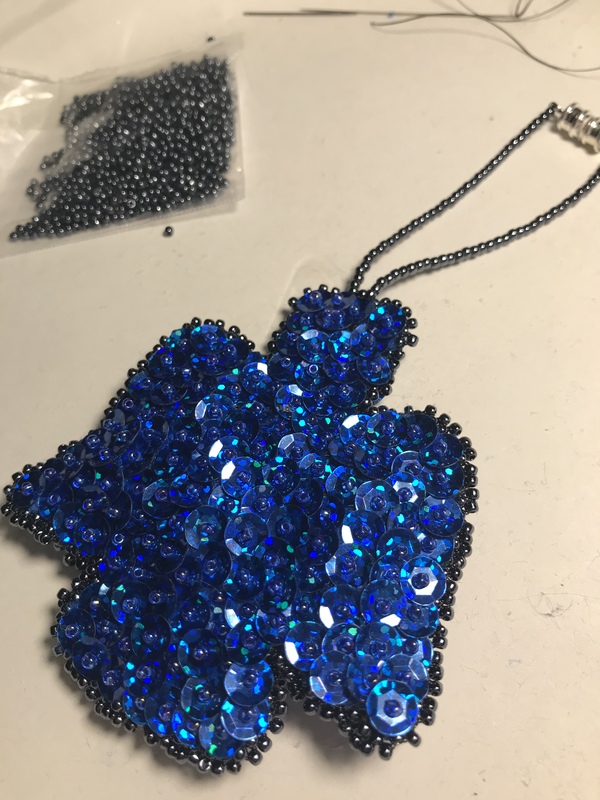 I figured I would share some of my projects and also tell you some things I am planning for this year. I am pretty excited and look forward to a very fun year !! 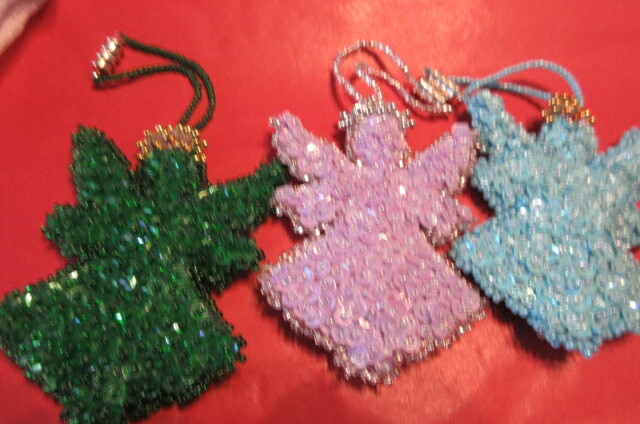 The four angels at the top , blue, green and lavender, were gifts for my mother in law who wanted them to hang around her house. 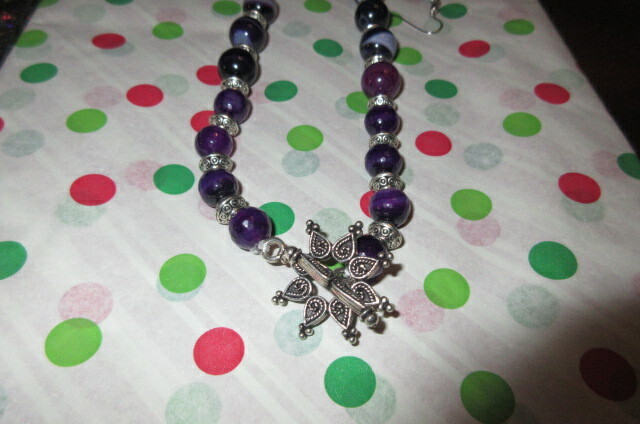 It took me way too long to do them as I was in that funk all year, but I got them done along with a pretty purple beaded necklace and earring set also pictured here !! 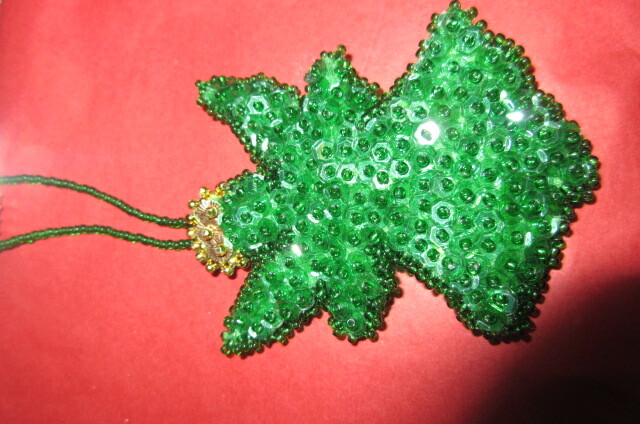 This green and black tree was a pin I did to wear with a shirt you can see behind it that had a beautiful black pattern on a green shirt.The picture makes it look faded, it was not !! 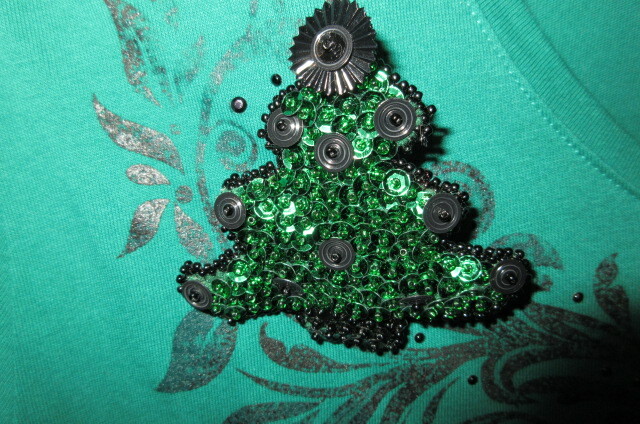 I love this pin and had a lot of fun using a rich green sequin and fun shaped black sequins. I am thrilled with how it came out !!! I plan to make a black and red heart for Valentines day to wear with the red shirt I have just like it !! 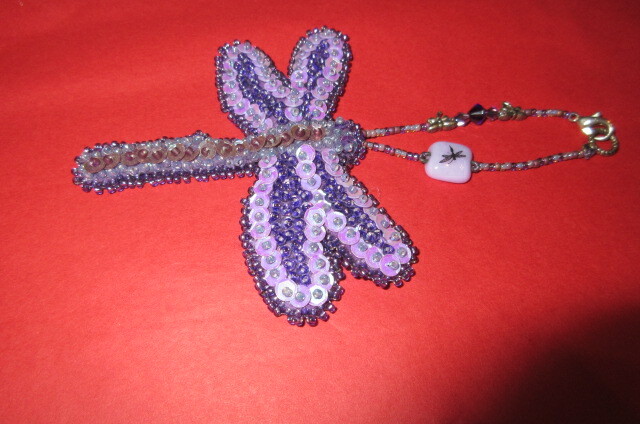 I made this purple dragon fly for my dear friend who I have done all the purple tassels for, and used some of her left over beads to decorate the loop !! 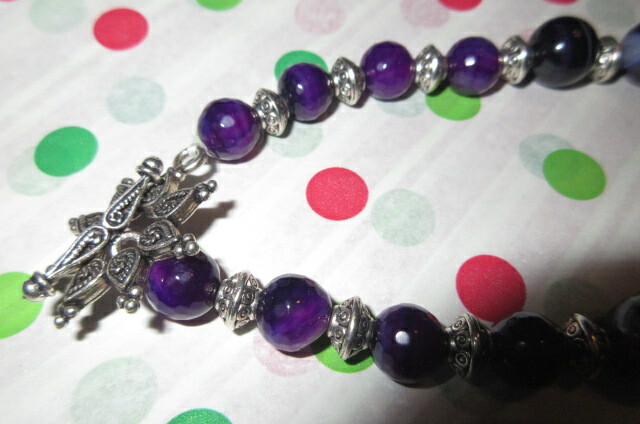 I had so much fun making it for her and was thrilled when she told me how much she loved it !! That means a lot to me !! 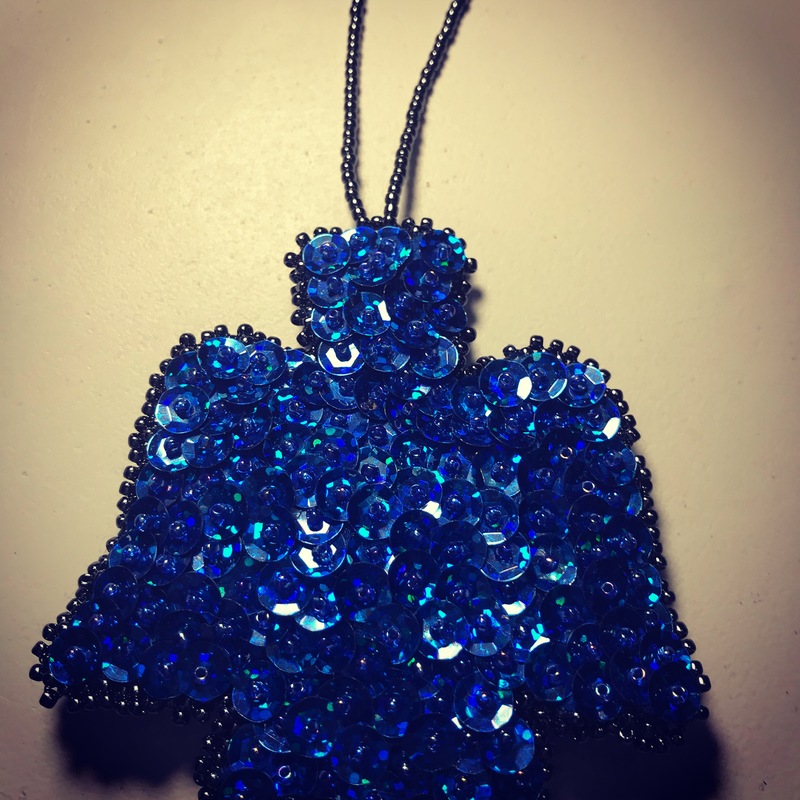 our oldest son got a brand new truck and wanted an angel to hang in it, all our kids love to keep an angel in their car hanging from their mirror. i will be doing one for our youngest daughter next. so , unfortunately the colors did not come out even close in the pictures. 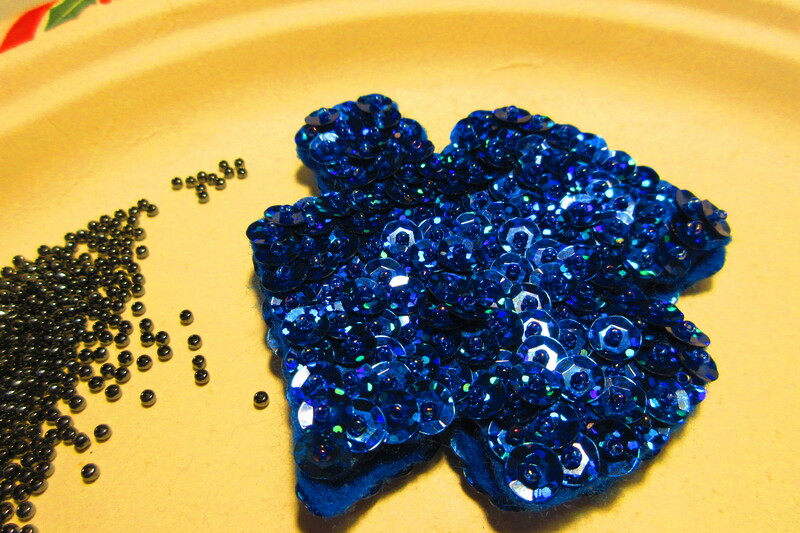 The sequins were a hologram sequins with both a rich cobalt and an electric blue. 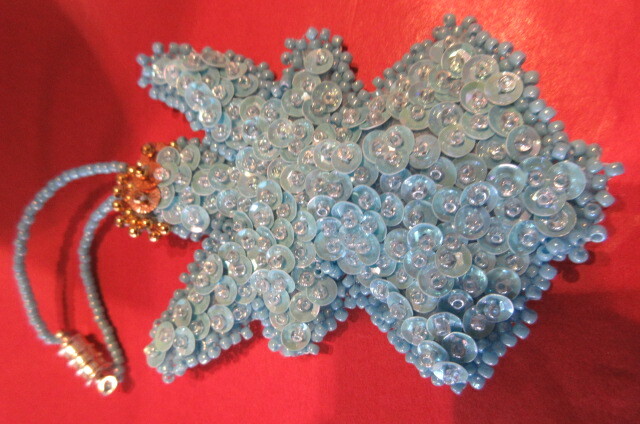 I used a hemetite seed bead, color only, glass seed bead, to accent the blue and match his gray interior. It is stunning, but pictures do not even do it a bit of justice !! 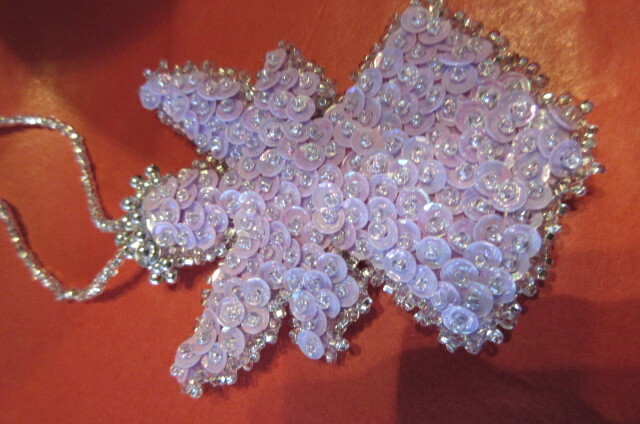 It has a loop with a magnetic clasp on it to hook on his mirror. 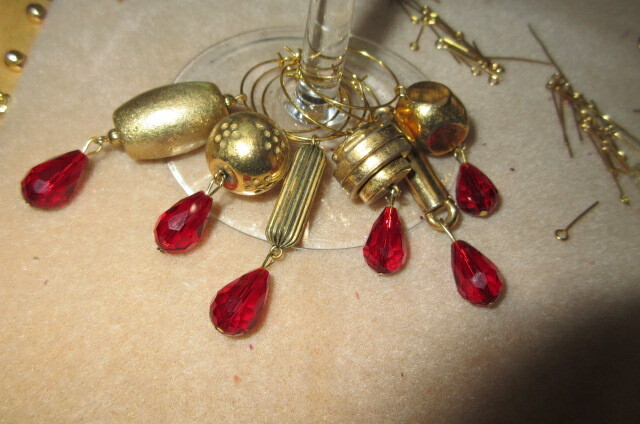 I made some wine charm sets for a customer which got me excited about making them again, so I made a few really unique ones, but they were not sold, I still have them listed so we will see !!! 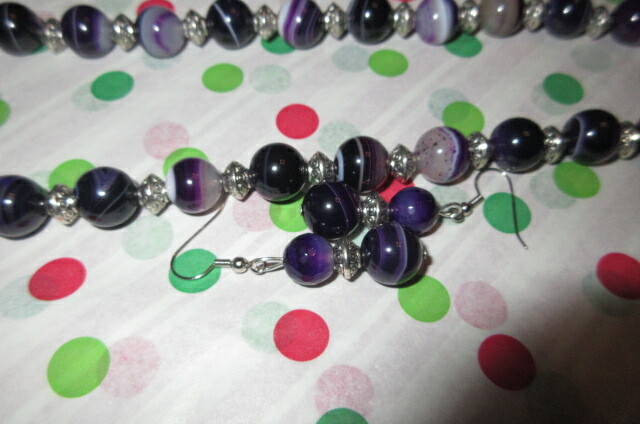 I have some other sets listed as well on my etsy page, there is a link on the side of this page !! 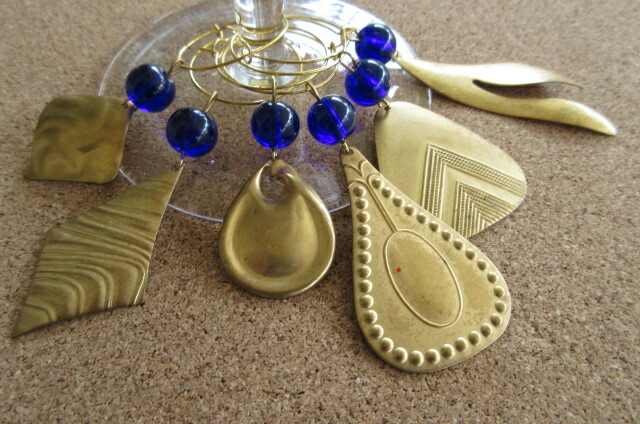 These are vintage gold tone beads and red glass beads on the top one, and cobalt blue glass beads with raw brass stampings, also vintage. Really pretty in person . So, had a fun and busy month of December and I am so excited for the new year. You will not believe what I am going to do this year, it is something so out of my comfort zone, but I am still very excited to do it. I am starting a YOU TUBE channel. 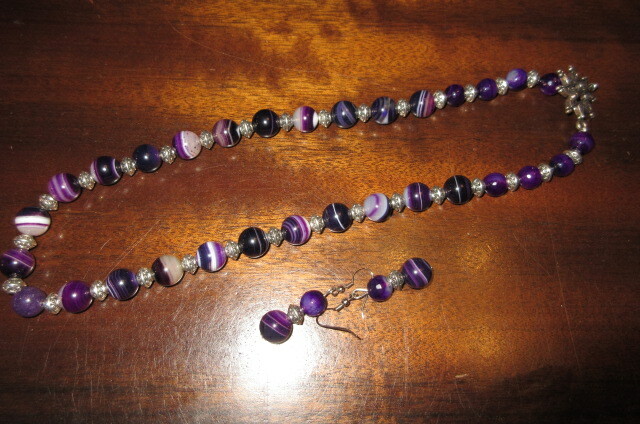 Stephies Beads and Baubles. There is no content yet, but our youngest son, who has had a few you tube channels and currently has one with a friend, is going to walk me through it and help me figure it all out. 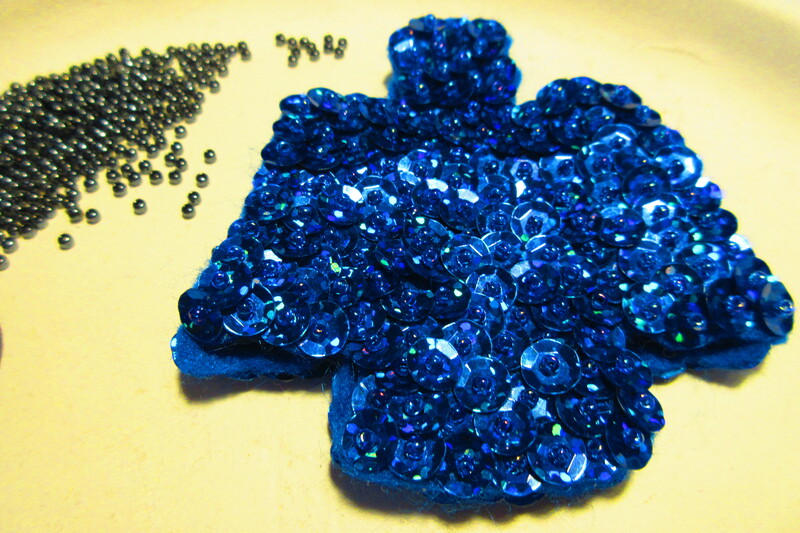 I am going to do different craft tutorials, bead work, beads and sequins, and lots of other fun things. My goal is to have the channel up and running with my first 8 to 10 videos on January 27th. I am starting with a bunch of Valentine Tutorials which will be so fun !!!! His brother, our oldest son, and oldest of the four kids, and his wife, gave my husband and I a wonderful new camera to get us started. I say us, because David plans to do some stain glass tutorials on his own channel , and we plan to start a channel together as well on urban homesteading as we put in a big garden and build a chicken coop. I do plan to get on this blog a lot more, that is going to be my full time job, blogging, vlogging and making fun things to sell. I am very excited, although very nervous as well. I am not waiting until I lose weight, so that I look better, I am jumping in now and going to have fun. I am tired of waiting to do the things I want to do. So, that is the end of last year and the start of this year !!! I am hoping to include our very creative kids and grandkids if allowed by parents, in some of my videos. Our kids are all very talented and I would love to show case their art as well. So, I am wishing everyone a wonderful new year and cannot wait to share my first videos with you all !!! Thanks so much for stopping by !!! It means so much to me ! !